A common question that IT leaders and adminstrators have when they learn about the powerful capabilities in PowerApps, and especially the ability for citizen developers in their organizations to build solutions that were simply not possible for them to create before, is – this is great and I see the potential but… how do I manage it, how do I make sure we don't end up with another 'shadow IT' problem, how do I put the appropriate governance policies in place, and more. On one hand IT organizations are keen on enabling business units to be more self-sufficient, at the same time they struggle with the risk that this poses. 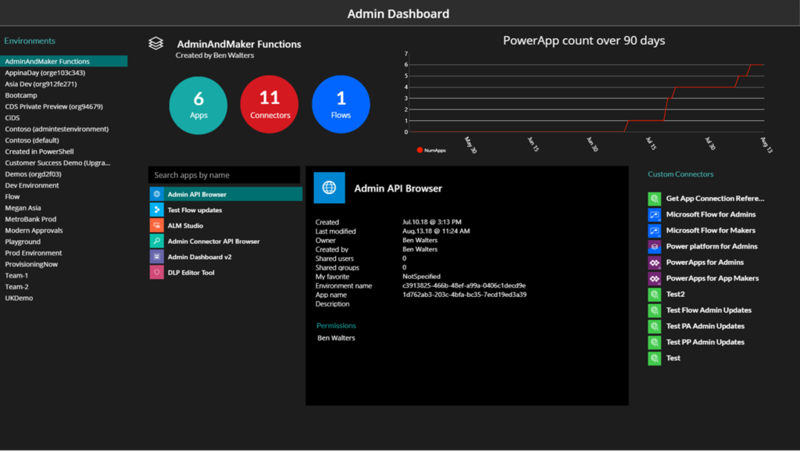 To address these needs, PowerApps includes an Admin Portal with a rich set of capabilities. However, we recognize this won't meet the needs of every organization. The governance needs of a 50-person company compared to a 10,000 person company compared to a 100,000+ multinational corporation will vary significantly. A driving mission of the Power platform is empowerment – to empower business teams to create the solutions they need. To empower the person closest to the problem to be the maker of the solution. Why not do the same for administration and governance? Why not empower IT teams with a set of tools and capabilities so they can be nimble in addressing the needs of their specific organization? The Admin connectors aim to enable exactly this. Much like PowerApps enables organizations to create highly custom bespoke solutions that are simply not available in off the shelf solution, the PowerApps Admin connectors enable the same for IT departments that are driving digital transformation across the enterprise. The core principle being – build the governance plan that is right for your org, with the right level of security, right level of monitoring, right level of alerting, and the ability to act quickly when changes need to be made – be it locking down usage of a particular app or connector, reaching out to an app maker to better understand their scenario, or promoting an application that has organically gained positive traction in the business, saving considerable time, money, or both. This blog post provides a couple sample scenarios to illustrate the possibilities, and a pre-built admin tool that you can download as a sample and starting point to build your own admin experiences. As a pre-read, see the recent announcement from August 2018 on the availability of new connectors dedicated to Administration and Governance for PowerApps & Microsoft Flow, which covers the breadth of capabilities available in these connectors. The scenarios below are just two illustrative examples of using the connectors in conjunction with your own databases/custom logic to address a governance requirement. Scenario 1: An organization wants to identify app makers that have published production apps without receiving the level of training deemed necessary for that organization. In this case, we maintain a list of users that received training and we cross check that list at the time where we drill down to the app details. Scenario 2: An organization wants to perform an audit of the applications and identify which app uses which connector(s). In this case, we are basically expanding the concept of DLP to be a bit more nuanced that what is offered out of the box with DLP. In other words, rather than blocking certain connectors (office 365 in our case here), one might relax the policy and create a dashboard experience where they can determine if an app using specific connectors requires additional reviews.